Richmond is located at the fall line of the James River, 44 miles (71 km) west of Williamsburg, 66 miles (106 km) east of Charlottesville, and 98 miles (158 km) south of Washington, D.C. Surrounded by Henrico and Chesterfield counties, the city is located at the intersections of Interstate 95and Interstate 64, and encircled by Interstate 295 and Virginia State Route 288. Major suburbs include Midlothian to the southwest, Glen Allen to the north and west, Short Pump to the west and Mechanicsville to the northeast. The site of Richmond had been an important village of the Powhatan Confederacy, and was briefly settled by English colonists from Jamestown in 1609, and in 1610–1611. 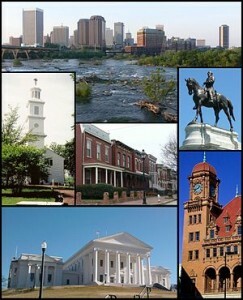 The present city of Richmond was founded in 1737. It became the capital of the Colony and Dominion of Virginia in 1780. During the Revolutionary War period, several notable events occurred in the city, including Patrick Henry‘s “Give me liberty or give me death” speech in 1775 at St. John’s Church, and the passage of the Virginia Statute for Religious Freedom written by Thomas Jefferson. During theAmerican Civil War, Richmond served as the capital of the Confederate States of America. The city entered the 20th century with one of the world’s first successful electric streetcar systems, as well as a national hub of African-American commerce and culture, the Jackson Ward neighborhood. Richmond’s economy is primarily driven by law, finance, and government, with federal, state, and local governmental agencies, as well as notable legal and banking firms, located in the downtown area. The city is home to both the United States Court of Appeals for the Fourth Circuit, one of 13 United States courts of appeals, and the Federal Reserve Bank of Richmond, one of 12 Federal Reserve Banks. Dominion Resources and MeadWestvaco, Fortune 500 companies, are headquartered in the city, with others in the metropolitan area.